To this list I added one more criteria: price should be under $5. Since I tend to be most interested in tech stocks, let me focus on inTest. inTest specializes in the hardware that interfaces between probes and the chips being tested. It also offers thermal testing equipment including test chambers. At a market cap of $42 million, they fall into the microcap category. The stock must be quite overlooked as it's valuation appears to be quite cheap. 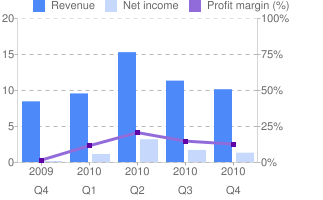 The PE is less than 6, Price to Sales is less than 1, Enterprise Value/EBITDA is under 5 and PEG is only 0.34. As mentioned above, the screen requires the stocks to be profitable and inTest certainly is as well as being cash flow positive. Note the reversal above the blue trend line and the surge above the 50-day moving average in addition to the bullish move in MACD. Though profitable, the company has been facing some financial headwinds. The following chart shows that year-over-year sales and earnings were good but the last few sequential quarters have shown declining results. The stock will report earnings next week so we'll see if they can show some better sequential results. In the meantime, however, it is worth noting that there have been a number of acquisitions in the semiconductor test equipment sector. inTest themselves recently bought a German firm. In any case, the sector is ripe for consolidation as many of the companies operating in the sector are small but profitable. In summary, inTest is a tech stock mired in deep value territory but with its technicals turning positive. It's potential to be a takeover target make it an interesting play but it makes sense to wait a few more days until those earnings are reported.